Your assignment today is to think about cheerleaders (this is difficult, I know). Have you been to any OSU sporting events recently? I was fortunate to be able to attend the OSU vs. Boston University game a couple of months ago. I was there to see one member of the squad in particular: Allen Waters. Listening to the cheers, watching the game, and staring in awe at the cheerleaders getting rocketed into the air, it’s easy to lose track of the fact that everyone on that court is a student as well as an athlete. Allen, one of several men on the cheer squad, just happens to be an electrical and computer engineering student. Now I know what you’re thinking — an engineering student surrounded by screaming fans and beautiful women? Well it’s true; and Allen has worked hard to balance athletics and academics to become one of the College of Engineering’s most outstanding and well-rounded students. However, Waters hasn’t always been a cheerleader; it’s something he’s come into quite recently. 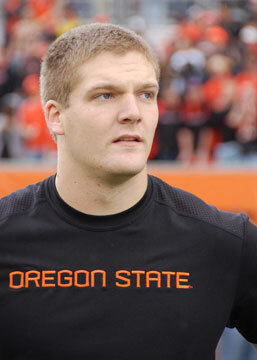 Allen, a 21-year-old senior, came to OSU from Wilson High School in Portland, OR. He came to OSU and chose electrical and computer engineering although he admits he knew very little about it. He liked math and science decided to take a few classes to see if it was a good fit. “I picked it because it’s what my dad did and I had to declare some type of major. I wasn’t sure I was going to stick with it,” Allen remembers. By the end of his freshman year, he was actually considering a switch to physics. However, after taking Digital Logic, a course that provides hands on experience building circuits and robots, Allen was hooked on electrical engineering. After that crucial turning point, Allen hasn’t looked back. He is now studying integrated circuits and loves it. While at OSU he’s had the opportunity to TA for introductory electrical engineering classes and also was a summer intern for OSU’s TekBots program. He recalls that “the TekBots program really pushes you to your limits. Don Heer [the advisor for the program] really knows what you’re capable of and he helps you discover your strengths.” Allen comments that the experience he gained while at OSU was invaluable when learning how to be an engineer. It helped him discover what he loves to do as well as what he is good at. 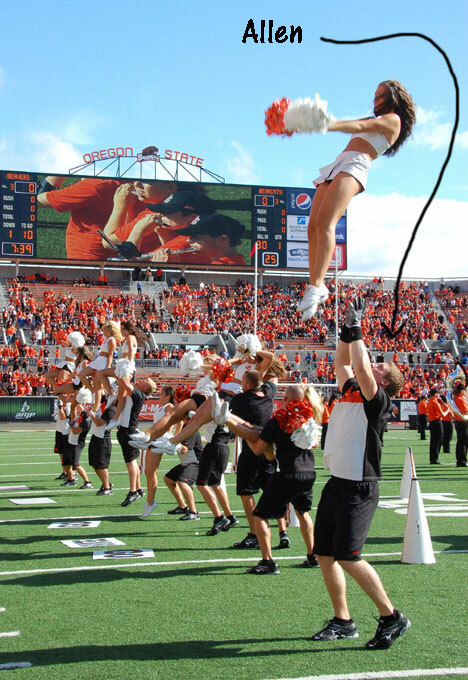 So how did such a successful engineering student become a cheerleader, traveling all over the country supporting Beaver athletics? “A year and a half ago it never would have crossed my mind,” Allen laughs. 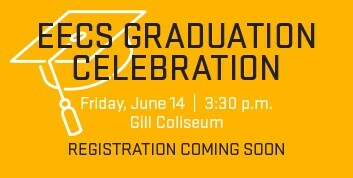 He remembers in high school being active in baseball and football but by the time he got to college he got so caught up in his degree that he spent the first couple of years focusing academically. By his junior year he was looking for a way to become more active again so he signed up for one of the many athletic courses offered at the Dixon Recreational Center. While there he met some people on the squad who encouraged him to try out, and the rest is history. Allen commented on the importance of maintaining a balance in a student’s life. “You don’t want to get stuck in a rut where you’re going to class during the day, studying, and going to sleep. 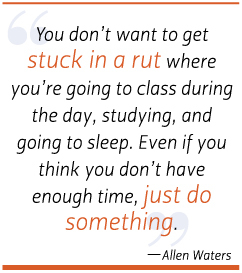 Even if you think you don’t have enough time, just do something.” By following his own advice, Allen has been able to balance his rigorous study schedule with activities that allow him to relax and just have fun. He has found this very important to staying sane while studying hard and earning his degree. When asked how he has time for all of his activities he responds, “Everyone has the time; it’s just a matter of making time. Sometimes you’re short on sleep but you get everything done.” When asked about his plans for the future, he responded he really wants to be a professor — after spending time researching and developing new technologies, he doesn’t want to stop. He is currently planning on attending graduate school to work on his masters and PhD in integrated circuits. He is currently deciding between the many programs to which he has been accepted, including Stanford and OSU. Jill Cheatham is a Post-Baccalaureate student in electrical and computer engineering, with a previous degree in opera. Currently she serves as an Ambassador for the College of Engineering, recruiting other students to OSU. She is also chair and founder of the Women of EECS, a group that fosters relationships between female faculty and students in Electrical Engineering and Computer Science. While at OSU, she plans to pursue a degree in the new Sustainability and Renewable Energy Track. When not working or studying, she enjoys running, tennis, and obviously singing.